On the day of a race or event, horses may need additional nutritional support for sufficient energy and strength. The Redplex Booster formula has a very high vitamin and mineral, folic acid, iron and antioxidant content. Redplex Booster provides nutrients such as vitamins and minerals (iron etc.) that are especially valuable for horses that are being worked hard. Raw materials:Dextrose, propylene glycol ; Additives : 3a- Vitamins, pro-vitamins and substances with similar effect : 3a700 vitamin E (dl-alpha-tocopheryl acetate) 77,560 mg, vitamin B1 520 mg, vitamin B2 260 mg, vitamin B6 140 mg, E672 vitamin A 435,000 IU, 3a316 folic acid 120 mg, vitamin B12 20 mg.
Analytical constituents:Humidity 40%, crude protein 0.5%, crude fats 1%, crude ash 2%, crude cellulose 1.5%, sodium 0%. Complementary feed for horses, to be given ahead of important events such as competitions, races and intense training sessions. Also for stallions during the breeding season. Daily allowance: 1 to 2 boosters, depending on the planned activity. 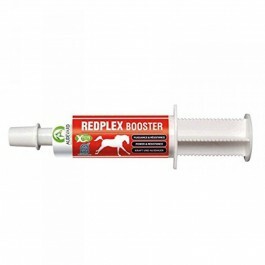 Administer Redplex Booster directly into the horse’s mouth, preferably between feeds and in the hours preceding exercise. Redplex Booster can also be administered after intense exercise.